SME House Builders - Help to Build - Pipe Dream or Necessity? Help to Build – Pipe Dream or Necessity? The current lending landscape for SME builders is bleak. 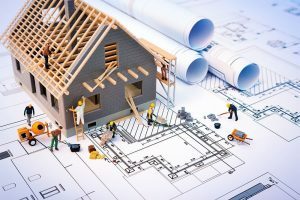 A survey last year by the Federation of Master Builders (FMB) found that 54% of SME house builders said that the lack of finance was constraining their ability to build more homes. In another FMB report, it is stated that the number of new homes built in 2016 by SME firms fell below a quarter of market output for the first time ever. While larger house builders are growing volumes, SME house builders are shrinking. This doesn’t make a healthy housing market from which to increase supply. Richard Werth, CEO of Troy Homes, says: “The ties holding back SME housebuilders are often financial and the current lending landscape for SME builders remains bleak. Borrowing is very expensive and requires substantially more capital than in the past. The Government’s Homes & Communities Agency and Lloyds Bank are behind the Housing Growth Partnership (HGP), which was set up to help address housing affordability. The HGP undertakes to partner and support SMEs housebuilders in sustainable growth, with the aim of increasing the number of homes they can produce. He continues “The current lending position for SME housebuilders is strangling our pipelines and slowing down the rate at which we can grow. If SME housebuilders are going to provide the new homes at the rate and quality that the market demands and the government wants, we need improved terms on loans so that we can retain more of our capital for investment in more developments and to bid on larger schemes. “There have been discussions about a government backed “Help-to-Build” scheme where, like Help to Buy, the government would support SMEs by providing guarantees on our borrowing. This would enable us to retain more of our capital for additional developments and enable us to build more homes. It is fair to say that, because Help-to-Buy has so successfully boosted demand, SME housebuilders need a Help-to-Build scheme in order to continue to grow supply to meet the UK’s housing needs. Help-to-Build could offer a guarantee to banks to encourage greater lending and use the banks’ network to ensure efficient distribution of enhanced loans. This is better than using the HCA or other government lending routes such as the British Business Bank.